The heart – a muscle working without exhaustion and breaks. It ensures the blood’s transport through the circulatory system. However, the conditions under which the heart is working do not always stay the same. An aortic stenosis, or increased blood reflow via the veins, strain the heart. In machines, the settings and scaling would have to be changed. Our organism, however, has its own ways of dealing with that. One of them is the so called Frank-Starling mechanism. What is the Frank-Starling Mechanism? Are you more of a visual learner? Check out our online video lectures and start your physiology course now for free! The Frank-Starling mechanism is a regulatory mechanism of the heart. It gets activated when the heart needs to pump an increased blood volume following increased venous return. That way, the continuity law is maintained. If the right ventricle pumping more blood than the left ventricle, congestion in the pulmonary circulation would be the consequence. The lungs’ vessels would have to take up more blood, causing a pulmonary edema. Similarly, if the right ventricle pumped less blood that is inadequate to sustain left ventricular function then, edema in the extremities would appear. Hence, a balance is important to maintain circulation. Point A marks the volume and the pressure at the end-diastolic volume load. In the isovolumic contraction phase, the myocardium contracts and the pressure rises, while the volume remains constant. At the end of this phase, Point B is reached. During systole, the blood is ejected. The volume decreases while the pressure keeps rising until Point C.
The myocardium relaxes and the pressure decreases. The volume, however, remains constant until blood flows from the atrium into the ventricle through the atrio-ventricular valve. The end-diastolic state is marked with Point D. It is shown that the ventricle never empties completely and a residual volume remains. After connecting points A-D, the resulting Area A1 approximately indicates the work provided by the heart. Area A2 shows the diastolic work. The change in volume from Point B to C is equivalent to the stroke volume. Resting tension curve (gray): this curve is obtained after filling the heart with a certain amount of liquid and measuring the resulting volume. With increased volume, myocardial extensibility decreases and the pressure rises rapidly. Isovolumic peak curve (green): while the volume does not change, the pressure rises to a maximum due to contraction of the heart. Isotonic peak curve (yellow): at a certain constant pressure, the stroke volume is determined by using a point on the resting tension curve. Afterloaded peak curve U (red): for every point on the resting tension curve, there is an afterloaded peak curve. It is obtained by drawing a vertical line until it crosses the isovolumic peak curve and a horizontal line until it crosses the isotonic peak curve. The resulting intersection points are connected to show the afterloaded peak curve. Point C is always on that curve. 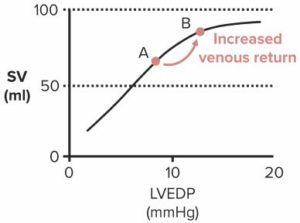 Adaptation of heart activity is necessary in a change of preload and afterload. The preload is the volume load at the end-diastolic phase (Point A). An increased preload is equivalent to a higher volume strain. In diastole, the ventricle is filled with more blood. The afterload is the resistance against which the heart must overcome to pump blood out of the heart chambers during systole; it is equivalent to the pressure inside the Aorta. An increased afterload results in a higher pressure burden for the heart – it has to pump against a higher resistance. Point A is pushed further to the right on the resting tension curve (A’). Pressure remains constant: Point B changes its position only on a horizontal line (by the same amount as A; B‘). According to a different starting point on the resting tension curve, a different afterloaded peak curve U 2 Point C and D are also shifted (C‘, D‘). The resulting work area A3 is bigger than under normal circumstances, the raised stroke volume is also measurable (SV1 < SV2). 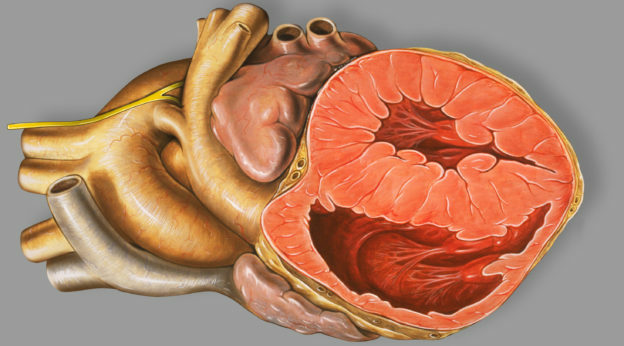 If more blood flows into the right ventricle in diastole, the myocardium is pre-stretched more. This enables a higher tension growth to raise stroke volumes. Raised aortic pressure demands more work done by the left ventricle, otherwise, the stroke volume could not be maintained constant. Point A does not change its position; the ventricle is filled with the same amount of blood. However, Point B is now on a higher position on the pressure axis (increased aortic pressure, B’’). Point C is shifted towards the top part (C’’) of the same afterloaded peak curve (Point A remains on the same position on the resting tension curve), the afterloaded peak curve is reached earlier. Initially, the stroke volume is decreased. A higher end-systolic volume is obtained: D is shifted towards right, too (D‘‘). During the next stroke, the same amount of blood flows into the ventricle, causing a raised end-diastolic volume. This state corresponds to an increased preload. The pressure strain is transformed into a volume strain. Keurs, H. E., & Noble, M. I. (1988). Starling’s Law of The Heart Revisited. Dordrecht: Springer Netherlands. Where is the work diagram of the heart? The diagram above have no labels that the work diagram text refers to.